Fantasy Sports Terms is the second part of the glossary. Included with the language of the game, there are 2 lists of Baseball abbreviations and Football position short forms. You can continue to expand your knowledge with lingo, jargon and FS terms for alpha letters I – Z.
IDP or Individual Defensive Players: refers to fantasy owners drafting defensive position players--lineman, linebackers or defensive backs. Injury Report: is a weekly report published by the NFL that lists all players who are injured. It includes the player’s name, position, type of injury, practice status, and game status. Daily fantasy football fans find this a useful tool to note whether certain players are scheduled to play. Keeper: yes, this is a player that stays or is kept on a fantasy team’s roster from the previous season by the same owner. Large-field Contest: refers to an event that involves a high number of entrants. The number of participants allowed to join is often unlimited. Therefore, a large number of winners each share the prize pool. Late Swap: refers to swapping one player for another before the event/game starts. Lineup: also known as a roster, it is composed of the players drafted before the first game of the contest. In daily leagues your line up is discarded at the end of each day. In standard leagues you choose your line up for each day of games based on the lineup you drafted. Mock Draft: refers to a practice draft to determine where players are being taken. Multi-Entry: contest where multiple entries are allowed. Examples are big GPP tournaments and qualifiers that usually allow multiple entries. Multiplier: term for a contest in which the points for a given player are multiplied by a predetermined factor. Overlay: Many daily fantasy sports sites host guaranteed prize pool tournaments in which a specified amount of prize money is made available to the winners. The site expects that the entry fees from the entrants will cover the prize pool. If there are too few entrants, the DFS site must contribute its own cash to cover the deficit. That deficit is known as the overlay. Performance League: term for a fantasy league that rewards players for yardage as well as touchdowns. Pick: refers to the slotted draft position for a team. Playoffs: event carried out post regular season to determine the league champion. PPR: refers to Points Per Reception. It is a type of scoring used in daily fantasy football where players earn points for each completed reception. It was originally introduced to lessen the importance of a team’s running backs. To that end, the PPR scoring system has increased the importance of a team’s wide receivers. Full-PPR: term for fantasy scoring system that awards one point per reception. Half-PPR or 0.5-PPR: term for fantasy scoring system that awards 0.5 points per reception. Prize Pool: term for the entire sum of money that is up for grabs in a daily fantasy sports contest. With the exception of GPP contests, the amount of the pool is usually equal to the sum of the entry fees collected from the entrants minus the DFS site’s rake. Punt: lingo for spending a little to get a lot. A lot referring to grabbing the high priced or valued players for your lineup. While this strategy may reduce your output, there is the risk of a value imbalance for the entire lineup. Qualifier: term for a contest in which the winners earn a seat at a future contest, typically one with a relatively high entry free. Rake: lingo for money collected by the daily fantasy sports site and kept for profit. It is sometimes referred to as a percentage of the entry fee. The percentage varies by site. Rakeback Program: based on your play, this program may result in a credit to your favor. Re-draft League: the opposite of a keeper league, these team lineups are wiped clean after the season. Therefore, every player is available to be taken from season to season. Roster: also known as the lineup. Salary Cap: refers to the total amount of money allocated to draft your lineup. Every team manager must stick to the same salary cap. The cap varies by site and sometimes by sport. In standard leagues the salary cap usually refers to draft day in auction drafts. Shark: a skilled and opportunity-seeking player on the prowl for fish. Sleeper: lingo for a player who has possibilities but attention is not being paid. This Sleeper could turn out to be a Keeper? Snake Draft: also known as a serpentine draft, it is a system in which participants take turns drafting players. The name refers to the snake-like structure defined in the order that the participants take their turns. The entrant who leads off the first round picks is last in the second round. He/she then picks first in the third round. Sportsbetting: is offered in 5 parts at gamerisms as it is a natural extension of fantasy sports games and fantasy sports terms. 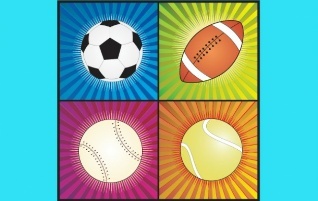 Find a sportsbetting glossary, quiz and facts-trivia. Stack/Stacking: lingo for matching more than one player from the same team or in the same game. This strategy is employed to increase lineup volatility or decrease lineup volatility. A typical match would be a QB=quarterback with one or more receivers. Studs-and-Scrubs: jargon for the roster mix of cheap and high-priced players. Tilt: as with poker, refers to making wild and bad decisions that are detrimental to player and bankroll. Train: lingo for repetitive strategy as with submitting the same roster multiple times in a multi-entry tournament. Transaction: refers to a lineup action like dropping, trading or picking up a player. Value Pick: term for a player who is considered to be more valuable than his salary implies. Good values are often found among players coming off the injury list with daily fantasy football. Additionally, sports players who are going through a bad streak should be a consideration. In both cases, the players’ salaries are often lower than they should be based on their past performance and career. Waive: refers to a player dropped from the lineup. Waivers: refers to a dropped player now placed in the position of a possible pick up by other teams. Generally, the team with the worst record in the league has first waiver priority to add a released player. Fantasy Sports Terms 2 is part of the FS Guide.